Superheroes and villains were again the resonating theme for this year’s Match Day and there is no doubt the Class of 2019 is loaded with superheroes at least. 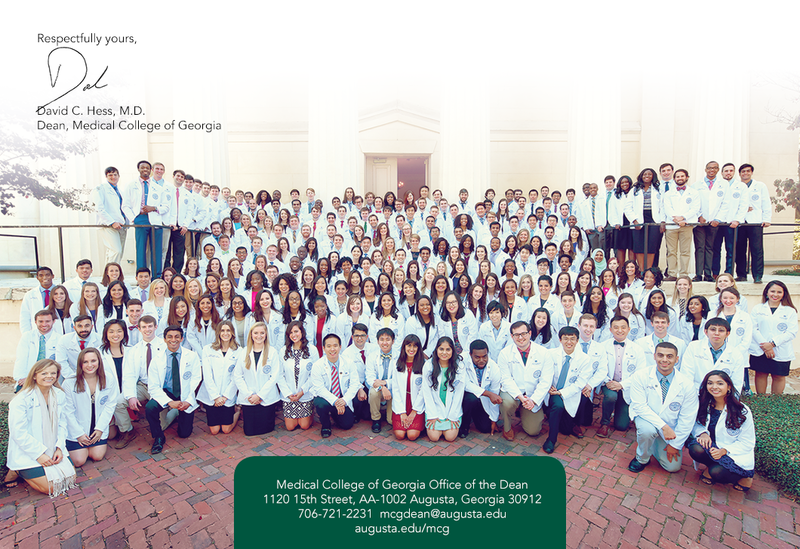 All told, our students matched in 34 states and 25 specialties and 25 percent will do their first year of GME in Georgia. Nationally a record 38,376 applicants competed for 35,185 positions and I am proud to share that in the long and proud tradition of MCG, 98 percent of our students matched. I cannot tell you how proud that makes me of our students, our educators and our MCG. Check out this great video produced by senior video producer Tim Johnson that gives you a real sense of the excitement and success. You can also check out more national Match stats from the National Resident Matching Program. Like many medical schools, this year we have expanded our categorization of primary care to also include emergency medicine, OB-GYN and general surgery as well as internal medicine, family medicine and pediatrics. This year 68 percent of our students will move into one of those specialties, which I hope bodes well for a state and nation that absolutely need more primary care physicians and all physicians really, as we have discussed. This definitely does. Before the cheers of Match Day had started, senior Danielle Whittaker got the great news she had received a National Health Service Corps Students to Service Loan Repayment Award for committing to provide health care for at least three years in a medically underserved area and she wants to do that in Georgia. She hails from Stone Mountain, has always known she wanted to be a pediatrician and quickly recognized that there are gaps in our system that she wants to help fill for children. In fact, she has already worked at Federally Qualified Health Centers, where she saw firsthand the need for health care that is experienced by too many. Then Friday came and she found out that she had gotten her top pick for training as well: a pediatric residency at Baylor College of Medicine, which has a special track for vulnerable and underserved children. What a week Danielle had and what a future she has. Congratulations and thank you Danielle. I know you will continue to make us proud. How is this for another superhero-medical student. Quante Singleton was a firefighter for nine years with the Atlanta Fire Rescue Department, but the day he found himself trapped in a burning building, he realized he had to vehemently pursue his dream of becoming a physician. He would come to MCG in 2015, win an American Medical Association Foundation Minority Scholars Award in 2017 and last week would win again, this time his top choice for an orthopaedic residency spot at Barnes-Jewish Hospital at Washington University in Saint Louis. Like most jobs, being a medical school dean has its privileges and pain but news like all of the above is close to the joy and pride you feel with your own children. Check out this piece by Ashley Osborne at WJBF-TV that does a great job telling the tale of our superheroes. Dr. Martha Tingen is another superhero. Last week she met with a small group of handpicked leaders from the state to begin to develop the Georgia 2020-2025 Suicide Prevention Plan, an initiative led by the Georgia Department of Behavioral Health and Developmental Disabilities. Allow me to share some other health statistics that are hard to hear. In our state, suicide is the second leading cause of death for individuals ages 10 to14 and 25 to 34. About 9 percent of high school students report seriously considering suicide within the past 12 months. Too many have tried more than once. Suicide is the 10th leading cause of death among Georgians ages 55 to 64, and in the United States overall. The number one group in Georgia that commits suicide is young, white males. This loss of life is taking a devastating toll on Georgia families and on Georgia. It is a loss that Dr. Tingen knows well. A little more than a year ago, she lost her oldest son Nathan to suicide. But as is her nature, she is now working diligently to prevent this major cause of death and pain. While this fight is likely her most poignant and personal, it is definitely not her first. Dr. Tingen has taken to rural Georgia to help prevent children from starting to smoke and to help their parents quit. She has led town hall gatherings to raise awareness about alcohol abuse and prevention among young people. She is a longtime, fearless opponent of the things that hurt us, and the people we love. That is why she is also such a natural choice for the new position of associate director for cancer prevention, control and population health at the Georgia Cancer Center. While she has long been a leader in prevention at our cancer center with a primary focus on tobacco, this new role solidifies and expands our commitment to prevention, with affronts to health like smoking, obesity and human papillomavirus infection. She will be taking on suicide here as well since we now know that the suicide risk increases significantly in the first year after cancer diagnosis compared with risk in the general population. I appreciate Dr. Tingen taking on these important, expanded prevention efforts. One thing that would be tough to expand is her commitment. Dr. Nagendra Singh, immunologist in the Department of Biochemistry and Molecular Biology, is working on the kind of prevention that starts inside our bodies. He is helping us better understand the path some of our B cells take to become plasma cells and how those cells in turn produce countless antibodies that protect us from viruses, bacteria and other invaders. His ultimate goals include selectively manipulating the path to enable better vaccines or even reduce antibody production against common pollens that are causing some serious nose running even as we speak. Dr. Singh came to us in 2006 after completing a postdoctoral fellowship at the Howard Hughes Medical Institute. We appreciate his efforts to help our bodies take even better care of us. Finally today, I know you join me in congratulating Dr. Jack F. Shern, 2007 MCG graduate and physician-scientist in the Pediatric Oncology Branch of the National Cancer Institute. Dr. Shern is among eight scientists selected as a Lasker Clinical Research Scholar, a joint initiative of the NIH and the Albert and Mary Lasker Foundation to foster great physician-scientists by enabling their work for the next five to seven years at the NIH. The new, elite group of early-stage investigators join 15 other scholars hired since 2012. Dr. Shern is doing important work to develop therapies that target the genetic variations driving pediatric cancer, its relapse and treatment resistance. Dr. Shern earned his undergraduate degree at Notre Dame, completed his residency training at the University of Chicago Comer Children’s Hospital followed by a pediatric hematology/oncology fellowship offered jointly by the NCI and Johns Hopkins. See what I mean about our proud tradition of educating the next generation. Thank you Dr. Shern. March 29 – Faculty Senate, noon, Lee Auditorium. April 25 – MCG Faculty Awards Ceremony, 5 p.m., Lee Auditorium. April 26-28 – Alumni Weekend, Dean’s Reception, 6 p.m., April 26, Harrison Commons. May 9 – Hooding ceremony, guest speaker Dr. Leah Brown, orthopaedic surgeon specializing in sports medicine and treatment of the knee, shoulder and elbow. She was an NCAA All American and two-time NCAA National Gymnastics Champion while a student at the University of Georgia. She is a graduate of The Ohio State University College of Medicine and served for two years as battalion surgeon at the Camp Pendleton Marine Corps Base in San Diego. She was a Medical Aid Station Director during Operation Iraqi Freedom and Orthopaedic Surgery Department Head during Operation Enduring Freedom in Afghanistan and has received the Bronze Star and Navy Commendation Medal. May 10-11 – Paceline bike riding event to benefit the Georgia Cancer Center. You can choose various routes and ride 20, 45 or 100 miles and raise $750, $1,000 or $1,500, respectively, to help us fight cancer. May 24 – Faculty Senate, noon, location TBD. May 30-June 1 – MCG Statewide Faculty Development Conference, Teaching Tomorrow’s Physicians Today: MCG’s Mission for Georgia, Jekyll Island Convention Center. June 21 – Faculty Senate, noon, location TBD. Oct. 19 – White Coat Ceremony, 2 p.m., Bell Auditorium.